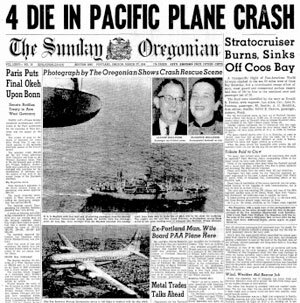 Pan Am Flight 845/26, en route from Portland to Honolulu, crashed in the sea 35 miles west of Coos Bay on March 26, 1955. The big four-engined plane, an hour of Portland International airport, was flying at 10,000 feet, 20 minutes past its last coastal check point at Newport when an intense 30-second vibration resulted in the right inboard engine falling off . . .
Less than half an hour after the cash, the U. S. S. Bayfield, a navy APA attack transport en route to Seattle, reached the scene and began picking up survivors. The likely cause of the accident was “loss of control and inability to maintain altitude following failure of the no.3 propeller which resulted in wrenching free no.3 power package.” After the accident the Civil Aeronautics Administration issued an advisory that Stratocruiser hollow steel propeller blades be replaced with solid metal blades. The airplane sank 20 minutes after it was ditched, but, remarkably, only four people died out of a passenger and crew list numbering 23.